One of our main areas of research at Artists Without a Cause is to find the best practices for art projects that are beneficial to communities. In this context we define a “community” as a group of people living in the same place who have a particular characteristic in common, for example in regard to their identity or experience that is politicised. This incomplete guide contains important points to consider before, during and after creating artworks with or about communities that one does not belong to. If you haven’t worked with communities before, start by working with ones that you are a part of. Working with any community requires many layers of sensitivity and understanding. One way to begin to learn this is to work with groups you already have a stake in. This way, you can immediately co-relate what you are creating to how you feel as a member of the community being represented in the work. 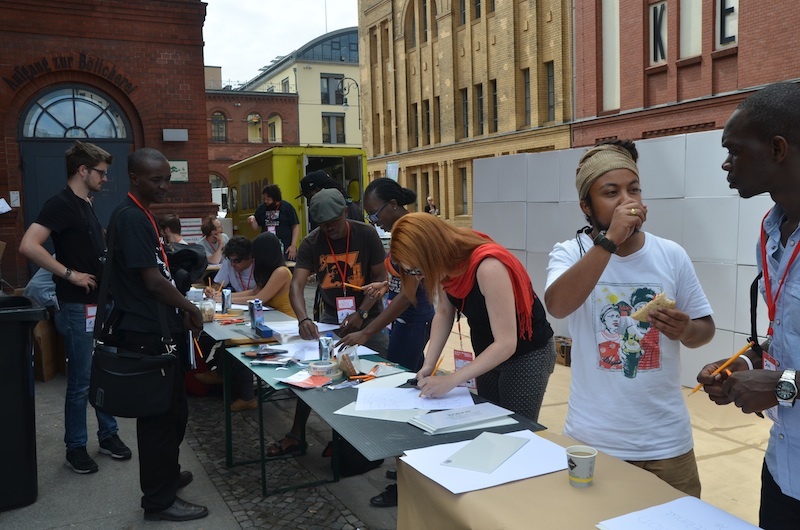 Tania Cañas, RISE art director and member, has written a comprehensive list of considerations when working with Refugee and Asylum Seeker communities that is applicable to all artists interested in working with any communities. Consider these ten points when working with your own communities and keep them on hand if you decide to make the leap to working with other communities that you do not directly belong to or whose lived experience you don’t share. We find points 3 and 9, respectively—Realise Your Privilege and Do Your Research—of extreme importance. We encourage all artists, collectives and arts organizations to use their networks to bring to light underrepresented issues and stories to new audiences. This is helpful in cases where misinformation, lies or no information at all are being circulated. Do consider, however, that according to Victor Strecher, a professor at the University of Michigan’s School of Public Health, experts have known for the last fifty years that “providing information alone to people does not change their behavior.” Awareness alone is not enough. Therefore, think of ways to encourage your audience to do more than just becoming aware. Provide them with a pathway to become actively involved with the issue you are addressing. Direct the people you want to inform about these issues to the websites, social media accounts, publications, and online interviews of community-led initiatives. Invite groups dealing with the same or similar topics to set up info tables, provide sign-up sheets for volunteers, and collect donations. This gives the audience and participants the opportunity to delve deeper into the topic, speak to those working directly to bring about change and sign up to join the cause. Even something as small as having pamphlets distributed at your exhibition or performance can lead people to becoming active with an organization or group. Please remember to offer to cover at least material costs. Artist Natasha Marin’s online work, ‘Reparations’, is an amazing example of this. Marin’s website allows white-identifying people to offer and fulfill requests by PoC and Black people. This social experiment allows for BPoC to heal with the help of people who have gained advantages through their historical and contemporary oppression. The project began as a Facebook event on July 15th, 2016 and went on to garner a large amount of media attention. A direct result of this were more requests and offerings, which are still being created (primarily on a closed Facebook group in order to avoid trolls). As Marin’s work became more popular, more requests could be fulfilled, directly benefiting the communities involved. Marin’s work is a very direct example. If you work more abstractly, find ways to directly fulfill needs of the community you are working with. If your work is funded or fundraised for, always pay community members for their labor and expertise on your project. Provide free licensing of your work to communities so they can utilize it in their campaigns, social media and websites. Remember to constantly mention the community groups and organizations in all press texts, interviews and presentations of your work both online and offline. Give credit where credit is due and acknowledge seniority in the struggle. It’s not because you mean well that it doesn’t cause harm. Very recently, Sam Durant faced criticisms for ‘Scaffold’, a sculpture work that was being erected as part of the Walker Art Center’s reconstructed sculpture garden. The sculpture is comprised of several gallows, one of which hanged 38 members of the Dakota Nation in 1862. Members of the Dakota community found the work traumatizing, inflicting additional pain, as the sculpture garden was on historical Dakota land. Durant and the Walker Art Center quickly met with members of the Dakota community to resolve the situation. In an interview with the LA Times Durant said, “For me, it was that the work no longer fulfilled my intentions. I always hope my work would be in support of Native American struggle and justice. To hear that it was harming them, I felt terrible. I had to change it.” ‘Scaffold’ was removed and Durant signed the intellectual rights of the piece over to the Dakota Nation. Remember that regardless of your intentions, if your work garners negative responses from the very communities you are working with, you need to admit your mistakes and rectify the situation: fully acknowledge your mistake, and actively commit to being more thoughtful and informed in the future.